When the CBS television show “Madam Secretary” premiered in 2014, many conservatives assumed it was simply a propaganda piece for former Secretary of State Hillary Clinton. As I have watched it, however, I have been impressed that the show is not a partisan hack job at all, but rather an intriguing look at foreign affairs and the diplomacy required of employees within the State Department. The fictional Secretary, Elizabeth McCord, navigates international crises with humility, moderation, compromise and thoughtfulness. As such, she does Clinton no favors. 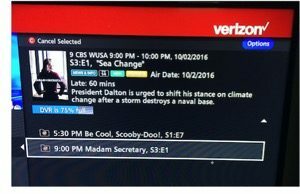 This week, the season premiere of “Madam Secretary” will address the issue of how climate change affects military bases, which my colleague Dr. Bonner Cohen recently discussed in a policy paper. I hope this episode will reflect the thoughtfulness and reasonableness I have come to expect from this show, rather than scare people unnecessarily by making speculations not founded in science.